Chartrand, Rene. The Forts of New France: The Great Lakes, the Plains and the Gulf Coast, 1600-1763. Oxford: Osprey Publishing, 2010. Illustrations, Maps, Photographs, Index. 64 pp. $10.42. Chartrand, Rene. 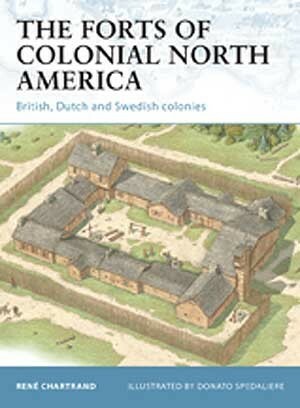 The Forts of Colonial North America: British, Dutch, and Swedish colonies. Oxford: Osprey Publishing, 2011. Illustrations, Maps, Photographs, Index. 64 pp. $10.42. 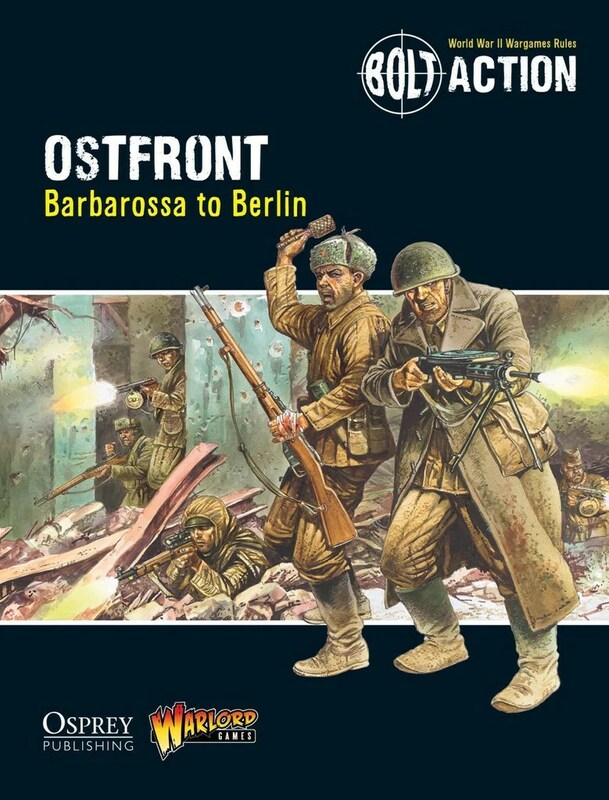 Many of you may be familiar with Osprey Publishing, which produces hundreds of titles related to military history on a variety of subjects. Those interested in the forts of the British colonies and New France will enjoy two titles that Osprey released a few years ago. Forts were important to the history of the colonial frontier, as some of the pivotal battles of the wars that occurred in North America between Britain and France were fought for control over fortifications (ex. Forts Duquesne, Carillon, and the fortress of Louisbourg). Therefore, understanding them and how they were constructed is important to understanding the broader competition for empire in North America. 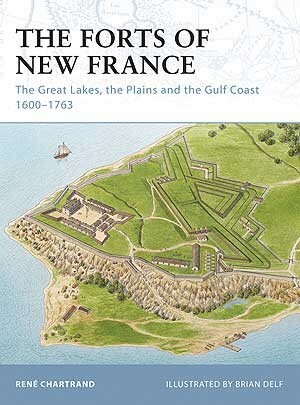 In 2010, Osprey released The Forts of New France: The Great Lakes, the Plains and the Gulf Coast 1600–1763 by Rene Chartrand. The book is a wonderful introduction to the various levels of fortifications and change over time of them across France’s far-flung colonial empire in North America. Several would be fought over during the series of wars between France and Britain (King William’s War, Queen Anne’s War, King George’s War, and the French and Indian War). The book is beautifully illustrated, as is customary for Osprey products, with several plates devoted to different forts in New France. The book follows a chronological and geographical flow, examining the forts of each region of New France (Gulf Coast, Plains, and Great Lakes region) from the earliest period of French colonial activity to the conclusion of the French and Indian War, when France was expelled and the territory transferred to British control. The garrison sizes were discussed, as most forts in the regions were smaller affairs, served by only a couple dozen troops. In addition to establishing French claim over the area, the forts served as centers of trade and establishments of relations with Native Americans. Many of the early forts were established specifically to facilitate trade with Native American groups, especially those in the Great Lakes area (the Pays d’en Haut). Most forts were simple wooden construction and relatively small, but some grew into very large stone fortifications by the eighteenth century. The forts covered allowed France to maintain its authority over such a vast swath of North America and make its claims over areas. They also served as scenes for the struggle for empire between Britain and France, and with Native Americans in North America. One fort that I was delighted to see included was Fort de Chartres in southern Illinois. I have visited this restored post several times, as it is only a couple hours from my hometown. The book discussed to two distinct fortifications at the site, first wooden, later replaced by stone, both under constant threat from the Mississippi River. Like the French, the English (later British), Dutch, and Swedes established forts in their colonies to serve as places to claim territory, establish trade with Native Americans, and protect their imperial frontier from French and Native incursion. In The Forts of Colonial North America: British, Dutch and Swedish colonies (2011), Chartrand examined the history of fortifications built by the English, Dutch, and Swedes during the 17th century and the conquest of the latter by the English. Later, these sites became the backbone of British control over its North American colonies and the front line of defense when war with France raged. Like the French, these forts also started as smaller, simple wood-constructed stockades, with some growing into larger wooden fortifications, or taking on stone facades. This book provides a wonderful general introduction to early colonial history along the American coast and traces the history inland, as Britain begins to establish inland forts. Several forts are illustrated in beautiful color plates that attempt to show readers what they may have looked like in their day. One fort that is featured is Fort William Henry, site of a major siege during the French and Indian War that was later novelized and dramatized in James Fenimore Cooper’s Last of the Mohicans and its film adaptations. Rene Chartrand was an excellent choice to write these works, as his background is fitting for writing such works for a broad audience seeking a general informative overview. He served as curator for over three decades for Canada’s National Historic Sites before venturing into freelance writing. This allows him to write the works for the casual reader that is seeking knowledge on the broad subject as opposed to a deep academic analysis. Both books provide wonderful information about the subjects they cover, including detailed maps, chronological tables of key events, as well as glossaries of terms related to the subjects, allowing readers who do not have the background to better appreciate the subject covered. Though geared towards general readers and non-academic audiences, these two books are great for those seeking to get an introduction to the forts of colonial America and some basic factual information surrounding them. They serve as a springboard for diving into other literature on the subjects of fortifications, New France, British America, relations with Native Americans, colonial military history, and a bit of engineering. Well-researched and illustrated, these two books are worth having on your shelf if remotely interested in colonial era fortifications. While they focus on the sites of empire, Osprey also suggests other related titles that deal with the troops of the various imperial powers fighting for control of North America. At less than $15, these books are a great deal to begin building a library on colonial history and can be enjoyed by readers both young and old, though I would say a good minimum age for these works would be around 12-14 given the subject matter and terms used. If a fan of Osprey books, or just a casual interested person looking for something different, certainly give these two works a try. Pressfield, Steven. The Lion’s Gate: On the Front Lines of the Six Day War. New York: Sentinel, 2015. Maps, Photographs, Index. 448pp. $18.00. The Six-Day War is a conflict full of controversy and strong opinions on both sides. 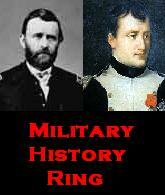 It has also garnered much interest in military history circles. Even wargaming has ventured into recreating the battles of the war, as Battlefront miniatures has a variant of their popular World War II game Flames of War, called Fate of a Nation. There have been many books written on this conflict and even more articles examining the various facets of the conflict, from weaponry used, to tactics, and the political considerations behind this war. Steven Pressfield has written a new popular history on the war that draws upon accounts from veterans of the war. 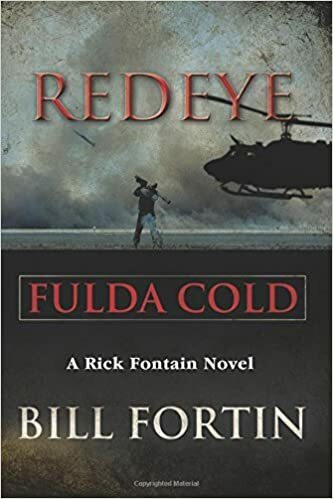 His new book The Lion’s Gate: On the Front Lines of the Six Day War covers the war through the experiences of men from select units in the Israeli Defense Forces (IDF). While not a comprehensive history of the conflict, the book does an excellent job of discussing the war from the ground up, which reflects the general trends in military history and conflict studies to study wars from the common soldiers instead of major leaders. The organization is quite good, divided into six “books” that cover a particular section of the war, including the Sinai, Jerusalem, and the lead up to the conflict. The prose is accessible to general readers and does not come across too academic in tone. While not meant to be an academic history, this work is a good resource for examining the war in detail for those seeking to start studying the war. The book also features several maps and photographs to aid in understanding the scope and reality of the war. 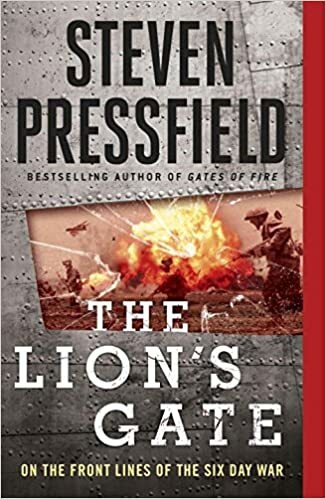 Praised by The Wall Street Journal, Marine Corps Times, and Los Angeles Times, Steven Pressfield’s The Lion’s Gate is a great new work on an important conflict in Middle East history. Gabriele Esposito, Armies of the War of the Triple Alliance, 1864-70: Paraguay, Brazil, Uruguay & Argentina (Oxford: Osprey Publishing Ltd., 2015). Maps, Illustrations, Photographs, Index. 48pp. $17.95. This book provides a succinct overview of one of the bloodiest conflicts in South American history, a war that devastated the population of Paraguay. Gabriele Esposito did an outstanding job of illustrating the significance of the War of the Triple Alliance to military history in Latin America. Esposito’s text on the various phases and forces of the war was aided by illustrator Giuseppe Rava, who provided the artistic talent to the work. Part of Osprey Publishing’s Men at Arms series, this work represents an important contribution to Latin American history for those interested in a brief overview of this historical event. Esposito examined all aspects of the conflict, including its background. He noted its unusual origins, as Paraguayan dictator Francisco Solano Lopez sought to cement his place as the Napoleon of Latin America and conquer neighboring territory to allow his landlocked nation access to the Atlantic. Having served as commander of the Paraguayan army for the previous twenty years, Lopez’s ambition caused him to lead his nation into a disastrous conflict. 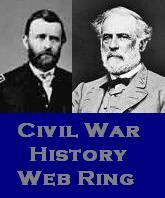 After brief overviews of the major campaigns and battles of the war, the work then turns to the specifics of the opposing forces, including equipment, leadership, and organization. The text was aided by rich drawings, period photographs, and beautiful artwork that demonstrated the overwhelming influence of the French military tradition that was prevalent in the Western Hemisphere armies, as evidenced by the similarities between the uniforms of Paraguay and Triple Alliance (Brazil, Uruguay, and Argentina), and those of the Union and Confederate armies. While the war began as the American Civil War was concluding, the descriptions provided of the arms and uniforms used by the belligerents indicate significant contributions from European powers, especially Britain, as well as the United States. Esposito noted that the Argentinian Army used sky blue cloth exported by the US for its trousers, similar to what Union troops used, as well as Uruguay’s use of the 1853 Enfield rifle musket, which was used by both Union and Confederate forces (40, 42). One thing that is important to note with this conflict is the profound influence of other modern wars that occurred approximately at the same time, including the Crimean War, Austro-Prussian War, and the Civil War, on the War of the Triple Alliance. Esposito stressed the important distinctions of this conflict, being the first modern war in South American military history, utilizing telegraph communications, weaponry, use of railroads, and balloon observation (4). This war was a bloody affair, with the population of Paraguay suffering immensely. Esposito noted that the country lost between 65-70 percent of its population as a result of the war, taking decades to recover (3). Paraguay fought a long and bloody guerrilla war until 1876 and Brazil and Argentina annexed roughly half of the nation’s territory. Not only was Paraguay utterly humiliated, it suffered a demographic shock, as less than 30,00o of the 160,000 Paraguayans left alive after the war were male, with the ratio of females to males averaging 4 to 1, with some particularly devastated areas having a ratio of 20 to 1 (22). The people of Paraguay suffered because its foolhardy dictator, with a Napoleonic complex, led it into a war it was unprepared for, a war that claimed his own life. Esposito’s brief study of this war is a wonderful examination of a major conflict that had profound consequences for the development of South America, but has largely faded from the larger historical memory of the world. Through outstanding research and great artwork, the various forces that fought for control over the Platine region of South America appear as a mix of professionally-trained soldiers and untrained militia, thrust into a major conflagration that proved bloodier (in proportion) that the larger American Civil War. Osprey did an outstanding job of providing information on the men who fought in the War of the Triple Alliance and this is a fine contribution to the larger Men at Arms series that will prove useful to those seeking general knowledge on the war, as well as those who may be interested in wargaming the conflict in miniature and want to know how to paint the forces. If you have a passing interest in Latin American military history, Armies of the War of the Triple Alliance should be on your list of books to read and acquire, as it will provide a great introduction and lead you towards further reading and exploration on this pivotal conflict.